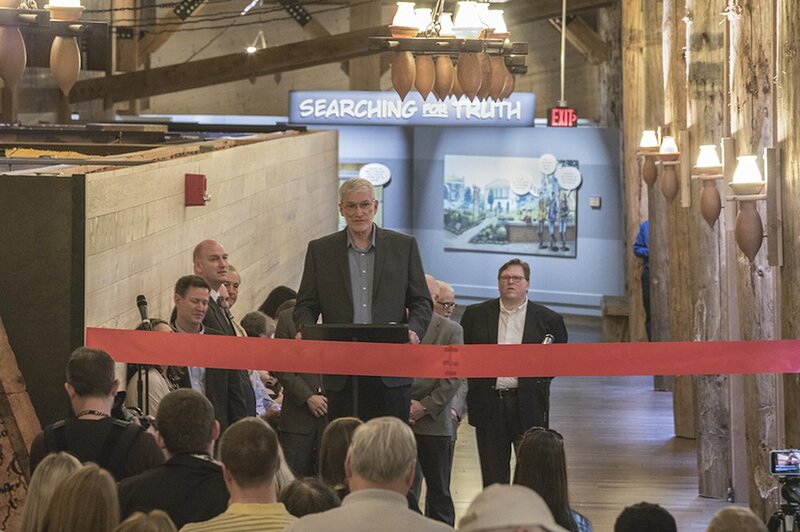 WILLIAMSTOWN, Ky. – Hundreds gathered on Friday to witness the opening of a “stunning” new exhibit at the Answers in Genesis Ark Encounter that addresses difficult questions about the Bible and artistically presents the gospel message. As previously reported, the Ark Encounter is a theme park in Williamstown, Kentucky that features a full-scale replica of the ark that God instructed Noah to build to escape the coming flood, as outlined in the book of Genesis. Thousands flocked to the project’s grand opening last July, and over half a million people have reportedly visited the 510-foot wooden ark since that time. In a blog post on Friday, Answers in Genesis President and CEO Ken Ham announced the opening of a “stunning,” 2,500-square-foot exhibit at the Ark Encounter called “Why the Bible is True.” The exhibit, which Ham said has been months in the making, fills much of the bow end of the ark’s third deck. “Why the Bible Is True features a contemporary, graphic novel style, with exceptional artwork that allows you to seemingly walk through the pages of a book,” Ham wrote. The exhibit presents the story of three college students whose beliefs are challenged by difficult questions about the truth of the Bible. “Is the Bible just another religious text?” “Are the scriptural manuscripts reliable?” and, “What about death and suffering?” are all questions addressed in the exhibit. Over 600 people and several TV crews from local media outlets were present on Friday to witness the ribbon-cutting for the new exhibit. “Our prayer is that this striking Why the Bible Is True exhibit and the new movie will challenge visitors with the truth of God’s Word and the gospel of Jesus Christ,” Ham said. In his blog post, Ham shared an email from Dr. David Wismer, who, along with his wife, is the sponsor of the new exhibit.